Tonny Del Solar talks about his late husband, Kevin Abeyta, on Friday at Los Amigos Del Sur, the restaurant they co-owned with two other people at the Main Mall. Abeyta died early Wednesday while saving a woman and her two children from a burning townhome. 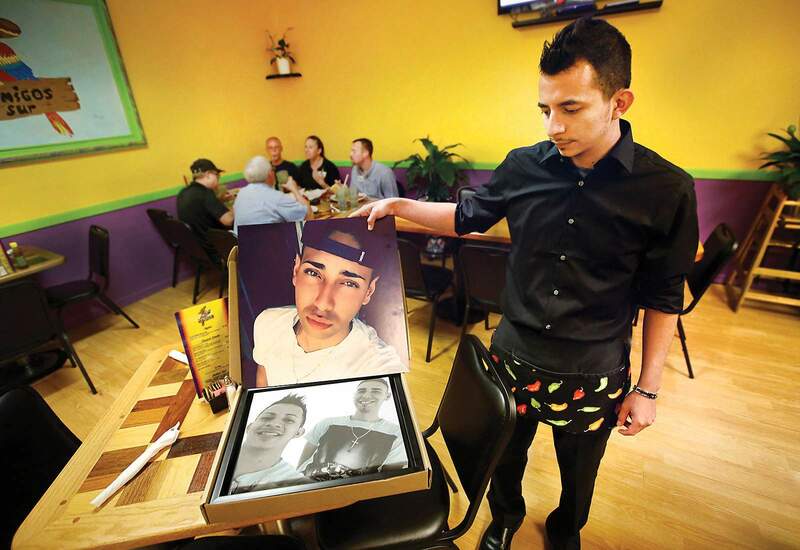 Tonny Del Solar grows emotional while talking about his late husband, Kevin Abeyta, on Friday at Los Amigos Del Sur, the restaurant they co-owned at the Main Mall. 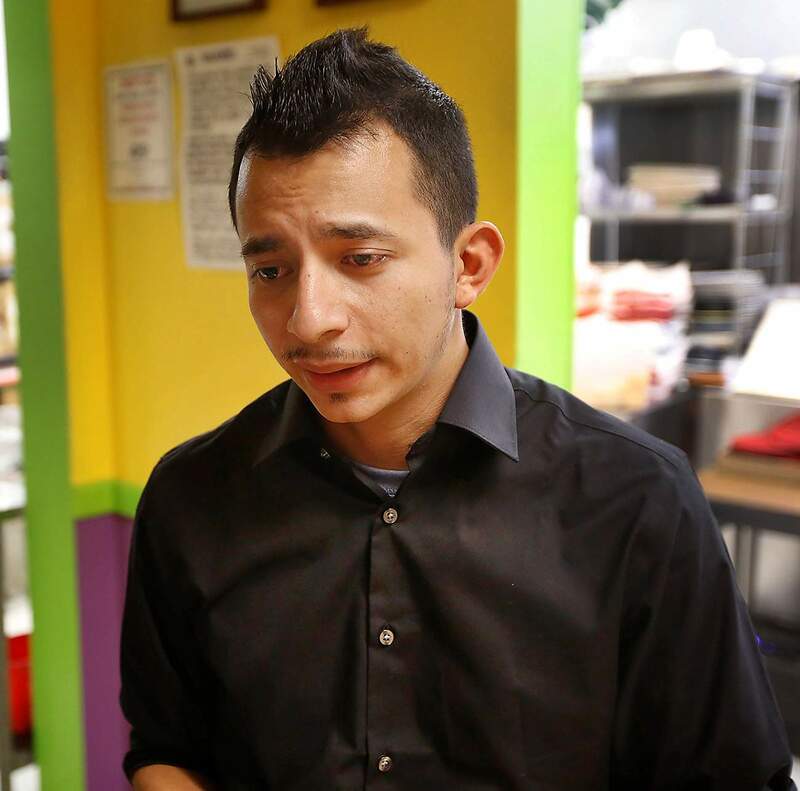 Del Solar said it was his dream to open a restaurant and Abeyta helped him achieve that goal. Kevin Abeyta died early Wednesday in a townhome fire in Durango. Abeyta and his husband were co-owners of Los Amigos Del Sur restaurant in the Main Mall. The restaurant was closed for a couple of days for the family to grieve. When it reopened Friday, customers and friends remembered a hero. Firefighters on Friday credited Kevin Abeyta, 24, of Durango with sacrificing his life to save a mother and two children from a townhome fire. 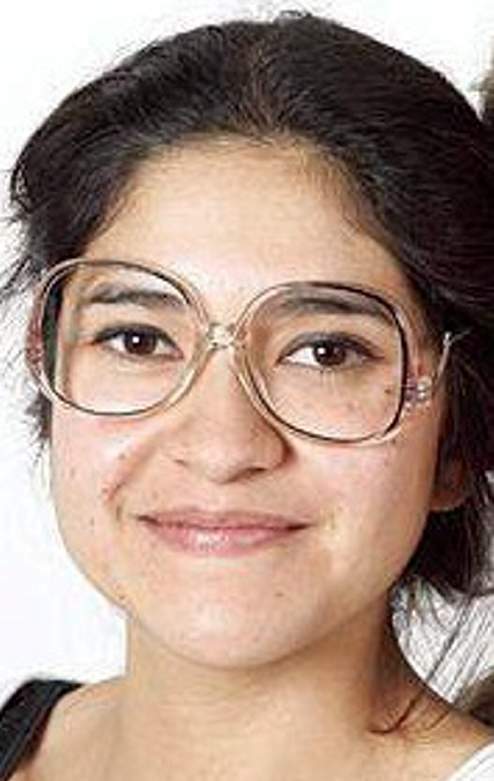 Family and friends identified the mother as Grisela Picasso of Durango, and her two boys as Ira, 5 and Rivers, 10. Picasso was taken to University of Colorado Hospital in Aurora with respiratory injuries. Her son, Ira, was taken to Children’s Hospital Colorado with second-degree burns to his left side and respiratory injuries. 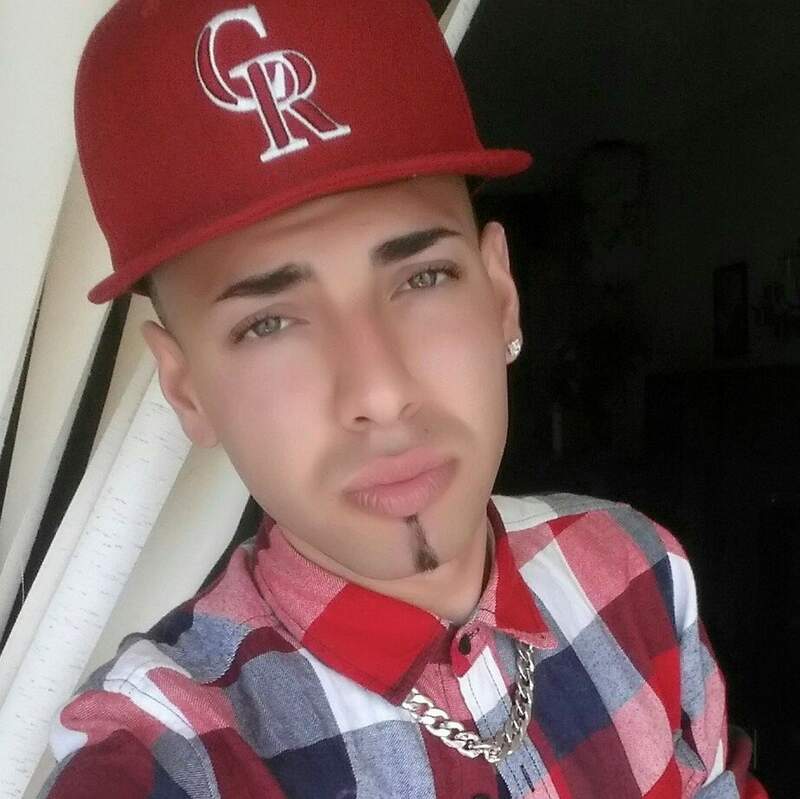 He was in critical but stable condition Friday, said his father, Anthony Martinez, who lives in Taos, New Mexico. The older boy, Rivers, was treated at Mercy Regional Medical Center and released. Martinez said he met Abeyta about three years ago, and it was clear he loved and cared for Ira, Rivers and Picasso. The cause of the fire that destroyed much of the Tercero Townhouse complex remains under investigation. Firefighters received the call at 1:48 a.m. Wednesday and arrived 5 minutes later to find the building in the 2100 block of West Third Avenue ablaze. About 20 permanent residents of the nine-unit complex were displaced. Grisela Picasso and her boys were staying temporarily with her sister, Hilda Picasso, at the townhome. Hilda Picasso was a permanent resident in Unit No. 2123, which she shared with Abeyta and his husband, Tonny Del Solar. In an interview Friday, Del Solar said it’s no surprise investigators are calling his husband a hero. “He told me, ‘I’m going back for those kids,’” he said. Hanks said firefighters never doubted Del Solar’s story, but they wanted to conduct a thorough investigation, including talking to people who were inside the unit, before endorsing that version of events. As of Friday morning, firefighters and police had no doubt Abeyta’s actions saved the mother and boys, she said. Abeyta and Del Solar opened Los Amigos Del Sur, a Mexican restaurant, in April inside the Main Mall. The restaurant was closed in the days after the fire but reopened Friday. Del Solar said it was his dream to open a restaurant, and Abeyta provided him with the motivation needed to make it happen. On mornings Abeyta dropped off Del Solar at work, Abeyta would assure Del Solar it was going to be a good day with a lot of customers. Del Solar said he was awoken by flames and smoke beside his bed about 1:45 a.m. Wednesday. He grabbed Abeyta by the hand and together they went downstairs and exited the townhome. That’s when Abeyta realized he had to warn Grisela Picasso and her boys. In at least a half-dozen interviews, friends and family described Abeyta as a generous soul. Del Solar said he cared about the people around him more than he cared about himself. If there was enough food for only one person, he insisted Del Solar be the one to eat, he said. And he would do that for anyone. Finances were difficult after opening the restaurant in April, but that didn’t stop Abeyta from comping some meals to customers he thought were more in need, Del Solar said. The restaurant uses a parrot in its logo. To help promote the new restaurant, Abeyta went online and bought a parrot costume to wear around town and at special events, his husband said. During slow times at the restaurant, he would say, “Parrot time!” and go put on the costume and walk up and down Main Avenue in an effort to bring people into the restaurant. His dream was to become a hair stylist. He practiced cutting Ira’s and Rivers’ hair, but Del Solar said he wouldn’t let Abeyta cut his hair until he had more practice. Del Solar said Abeyta, a Durango native, was one of the hardest workers he has ever met. He maintained two or three jobs until giving all of his time to the restaurant. Other places he worked included Economy Nissan, Tacos Nayarit, Albertsons, China Cafe and a medical testing center in the Tech Center. He made friends in far-flung corners of the community, said Eric Kiefer, who was eating lunch Friday at Los Amigos Del Sur. About six former coworkers from Albertsons had lunch and recalled stories of Abeyta on Friday at the restaurant. Tamra O’Toole, who was his boss, said Abeyta was her favorite employee for his personality, work ethic and consideration for other people. He bought her a bottle of booze with glittery, purple liquid for her birthday, she said. And after he left Albertsons 2½ years ago, he sent her a Facebook message thanking her for everything she taught him and not making him feel bad for quiting. “You just couldn’t not love him,” O’Toole said.